Letters to Elijah: Auctions are exciting! A local friend of mine asked for my help to sell some Packer Tickets online. We did this last year and after all the expenses he ended up making around $150 for 4 tickets. Not bad. This year the tickets are doing a lot better! Check out the auction here and here and share in my excitement! It ends this morning! Cover price per ticket is $59/ticket. Why are Packer tickets so valuable? Season tickets have been sold out since 1960! People around here put their season tickets in their wills! 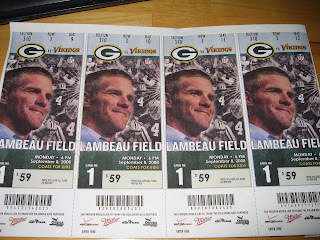 Notice the photo of Brett Favre on the tickets - it's like we knew he was coming back - or is he? stay tuned. UPDATE: THE TICKETS SOLD FOR $1001.50 wow! Brett Favre - I keep hearing news that he is strongly considering the Bucs! GO BUCS! (LOL!) - Anyway, I have a close friend from WI and I know that there are no fans as fanatic as Green Bay fans. They truly are the best as far as fans go.